The Outlander by Gil Adamson, a Mysterious Review. Review: The International Association of Crime-Writers 2008 winner of The Hammett Prize for Crime-Writing by a U.S. or Canadian author, The Outlander is Toronto writer Gil Adamson's powerful debut novel of a twenty-year old widow's incredible struggle to survive against overwhelming odds - the pursuit of twin vengeance-mad redheaded brothers-in-law, the unforgiving wilderness of the 1900s northwest mountains and forests, and the all-consuming ravages of the Frank slide, one of North America's worst ever natural disasters. From the opening line of, "It was night, and dogs came through the trees, unleashed and howling," to the final words, "Find me," on the last page of the story, and with all of the exactly right words in between, the novel grabs and holds from first to last. Maddened from her 34-year-old husband's neglect, the death of her infant son and the cabin fever of her homesteading existence, 20-year-old Mary Boulton kills her unfaithful spouse with a rifle shot to the leg, watching his blood and his life drain into the dirt floor of their single room cabin before taking off on a spectacular run for her life. Through her intuition and wits the young woman, "Widowed by her own hand," manages to elude her pursuing brothers-in-law as determined to catch her as she is to escape, as Adamson shows in storyline cross cuts between the hunted and the hunters. After an interlude with an eccentric dowager and her retinue, Mary and the "dark shapes" of her memories and the sack of items she has stolen, press onward to anywhere away from the twins. For a while she finds solace and even the warmth of real love with a mountain man, William Moreland, known to the Forest Service Rangers as "the Ridgerunner" for his ability to raid their cabins and evade their capture. Regrettably for the lovers, Moreland's own demons motivate him to desert the widow, leaving her once more desolate and destitute and with the twins and a tracker they've hired still in hot pursuit. With the help of a not-too-friendly Indian and his gracious white wife, Mary gets to the ramshackle tent and mining town of Frank. Here, a kindly Reverend Mr. Angus Lorne Bonnycastle - "Bonny" to his friends and his flock- becomes her guardian angel, and she encounters some of the Lord's strangest castoffs – McEchern the dwarf, for one example, who runs the town's trading post and, for another, Giovanni the Italian talking, "colossal, hump-shouldered creature with a heavy head" who supplies the town's booze from his hidden still. Between building a ramshackle church and converting the miners to his faith with a baptism of fisticuffs, Bonny deals in stolen horses brought to town by the eight Cregan brothers, the black sheep of the 15-brother Cregan clan. And all the while Mary's own dark avengers, the redheaded brothers are circling relentlessly closer. But before they can swoop, nature takes its own revenge for the underground gouges of the local mines and hurls down the top of the mountain to obliterate the town. While Mary escapes the devastation that Adamson describes in meticulous detail, the photograph of the widow that appears in newspapers nation-wide comes back to haunt her and leads to her eventual capture. But her intuition and ingenuity rise again, resulting in an incredible escape, a reunion with William Moreland and her final note, "Find me." 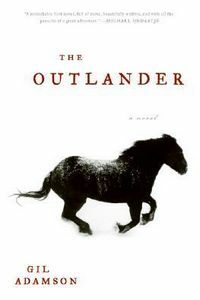 For readers who want a cracking good story with unforgettable characters engaged in tension-filled activities, and told with a superlative richness of language and a lushness of imagery, Gil Adamson's novel, The Outlander, is it. Her widow, Mary Boulton, and "Bonny", her Reverend, are the ideal stuff and stuffings of legends. Special thanks to M. Wayne Cunningham (mw_cunningham@telus.net) for contributing his review of The Outlander.